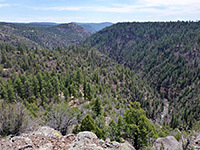 The three main access points to the generally remote and little-visited Sycamore Canyon in central Arizona, all reached by unpaved roads, are in the far south near the Verde River confluence, in the middle at Sycamore Canyon Overlook (a viewpoint only, no trails) and in the north at Sycamore Falls, also known as Paradise Forks, where the west branch of the upper canyon starts dramatically via a pair of seasonal waterfalls over black and orange basaltic cliffs. This latter place is the easiest reached of the three, 11 miles from Interstate 40 on good, smooth tracks, and is also the start point for the Sycamore Rim Trail, an 11 mile loop that for about half of the distance follows the rim of the two upper forks, incorporating a fine viewpoint (Sycamore Vista), high above the confluence, and for the other half crosses the forested Kaibab Plateau, where the route is mostly level apart from a climb to an isolated summit, 7,287 foot KA Hill. 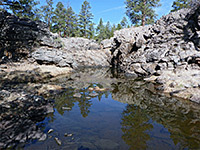 The upper reaches of the west fork of the drainage, above Sycamore Falls, are also notable for several deep, permanent pools of clear water (Pomeroy Tanks) beneath black lava cliffs and other jagged formations, while the upper end of the east fork also contains a few pools, just a little less photogenic. So, although relatively long, the path passes an excellent variety of scenery, and encounters a reasonable number of wildflower species in the summer. The trail is not much-publicized, however, and the full loop is infrequently hiked; most of the few people who visit are instead here for rock-climbing, up and down the sheer, jointed walls below Sycamore Falls. For a shorter walk, the obvious target is Sycamore Vista, 1.6 miles from the Falls trailhead. Sycamore Canyon overview map, Sycamore Rim Trail topographic map. 27 views along the trail. Sycamore Vista, full screen version (28 mb). Sycamore Falls, full screen version (32 mb). Sycamore Falls is reached by an easy drive from I-40 exit 167 (Garland Prairie Road), on a road, Hwy 146, that is briefly paved then smooth dirt, heading southeastwards for 8 miles then veering south at a junction, the route now designated FR 109. Destinations along this and side roads are not signposted initially but are after a while. 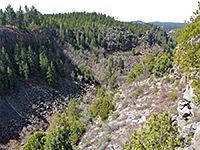 There are two trailheads serving the Sycamore Rim Trail; the first is near Pomeroy Tanks, the group of big pools along the upper west fork of the drainage, while the second, the most used, is half a mile further south, at the falls. 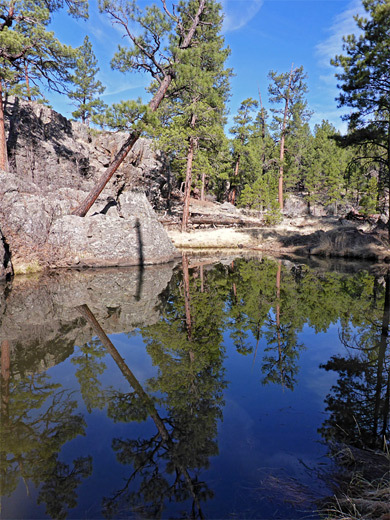 Notices suggest that primitive camping is not permitted at the trailheads, but there are plenty of suitable locations close by. 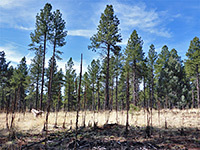 All this region is thickly covered by tall ponderosa pines, and all is within the Kaibab National Forest. Walking the loop in a clockwise direction seems best as then the most spectacular section, along the canyon rims, is left until the second half. From the Falls trailhead, the path descends a wooded slope, crosses the rocky, usually dry creekbed of the west fork of the drainage (aparently known as Isham Spring Canyon) just above the falls, and then divides, at the start of the loop. Turning left, (north), the path continues through light woodland, crosses to the west side of the creekbed and soon passes the first big pool at Pomeroy Tanks, one which has a huge fallen pine trunk lying across. 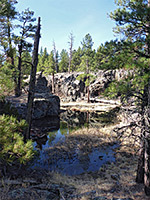 The trail then rises slightly to pass a rockier part of the drainage containing more ponds, then reaches the short spur to the Tanks trailhead. 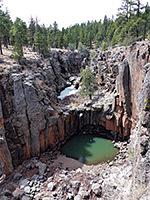 Next are a few more photogenic pools, backed by lava cliffs, all usually containing still water that creates perfect reflections on a sunny day. Lilies flower on some of the pools in summer. The path stays beside the creekbed a while longer, coming close to the largest pool of all, then turns away to the northeast, entering more open terrain of short grass and widely spaced pines. All of the route is well marked by cairns and notices on trees, and is easy to follow, the only minor problem being many protruding rocks embedded in the ground. The path crosses the Overland Road, which was established in the 1850s as a cross-country wagon route and is now partly maintained as a long distance (25 mile) walking trail; it intersects the loop again after 2 miles, allowing a bypass of the climb up KA Hill. The main trail soon intersects a forest track (FR 150), also a potential short-cut, followed by a lesser track, after which the gradient gradually increases, though is never too severe, and the woods become more dense. 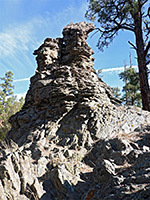 The last part of the ascent is up a shallow ravine and along a ridge, up to the KA Hill summit, partly formed of jagged, lichen-covered basalt. The views extend a long way in all directions, just slightly obscured in a few places by the trees. The most noticeable feature in the foreground is the vast grassy plain of Garland Prairie to the northeast, beyond which are the snow-capped San Francisco Peaks. The descent from the summit is steeper and quicker than the climb up, with a few switchbacks, back to pine flats. and the crossing of another forest track (FR 030), which leads south to the trailhead for a short spur to Sycamore Vista. The last major junction, after a brief traverse of a long grass meadow, is with the Overland Trail once more, soon after which a sign gives the onward distance as 4 miles to the vista point. The path continues to the rim of a shallow ravine - the upper end of the east fork of Sycamore Canyon, which is followed southeastwards. 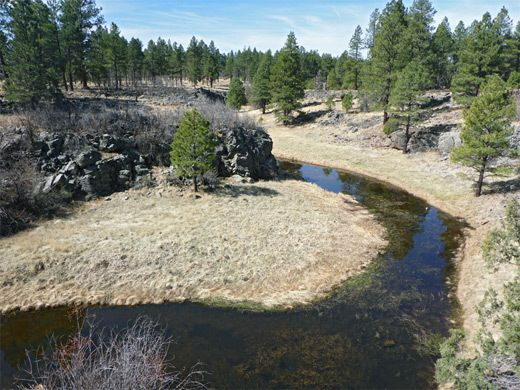 This drainage contains several long, permanent-looking pools, some lined by reeds, and also a couple of springs, named Dow and L O. An unsigned junction, a connector to FR 338, is passed on the left, then the path crosses to the southwest side of the ravine, returning briefly to the creekbed but otherwise staying on the rim, at one point passing above a particularly large pool. A faint track crosses the creek, below some pylons, as the drainage slowly deepens, and the path now crosses dead flat land generally just out of sight, moving further away in a few places to cross minor gullies. 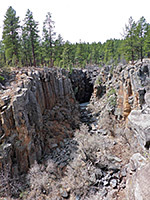 It comes closer again, by which time the gorge has become deep and wide, having cut down through the hard volcanic basalt into the softer, underlying, light brown Coconino sandstone. 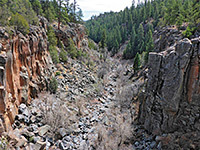 As the confluence with the west fork approaches, the path veers away for nearly a mile, up to the junction with a minor trail from the north, marked Vista Point Trailhead. 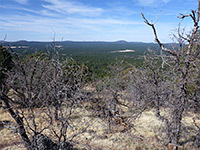 The loop trail curves back to the rim - the vista point (see 360 degree panorama), where the views are perhaps not quite so distinctive as the canyon sides are sloping rather than sheer and nearly all surfaces are thickly covered by trees and bushes. The trail continues close to the rim, of the west fork, for one mile, before moving away for the last time, now crossing mostly treeless land. The west fork seems a little less dramatic than the east, having fewer sheer rock faces, and more vegetation. The final stretch of the loop path curves briefly north and then back south, descending a wooded slope to the junction near the northern falls - a sheer drop of about 70 feet into a large pool, frozen solid until early summer since it is shielded from the sun by sheer black cliffs. 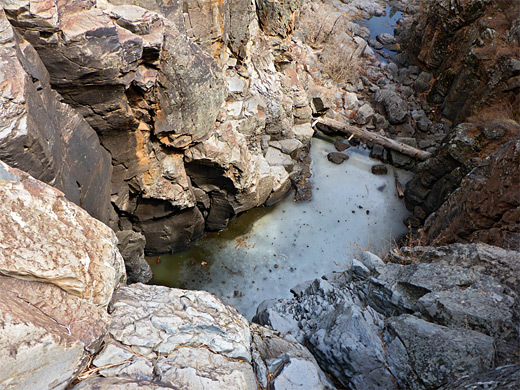 Climbing down unaided is possible in at least one place, allowing exploration of the canyon floor. The southern falls, 500 feet away on the far side of a minor ridge, are even more dramatic, containing two drops, the latter above a very deep pool.